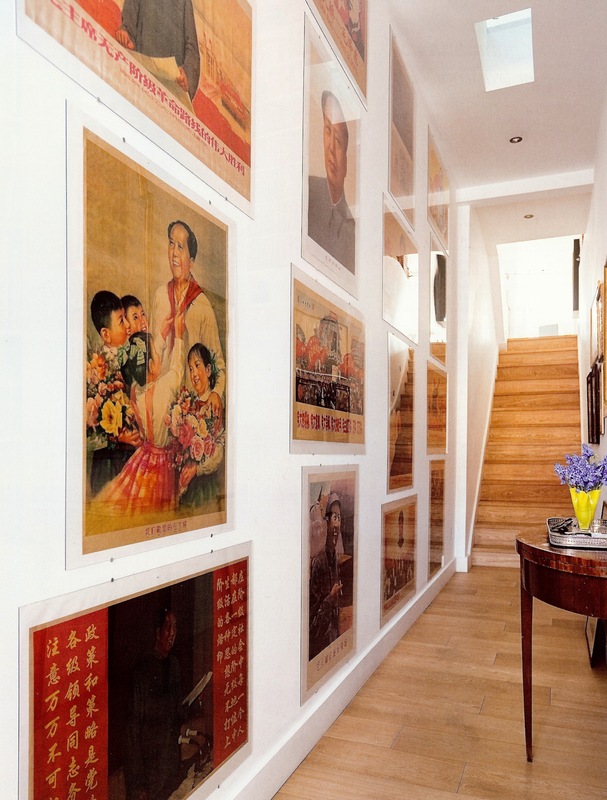 Grand picture walls offer maximum impact and color in any space from a hallway to a gabled room. Grand picture walls present themselves in a variety of ways. A wall can be considered grand due to the size of the pictures. 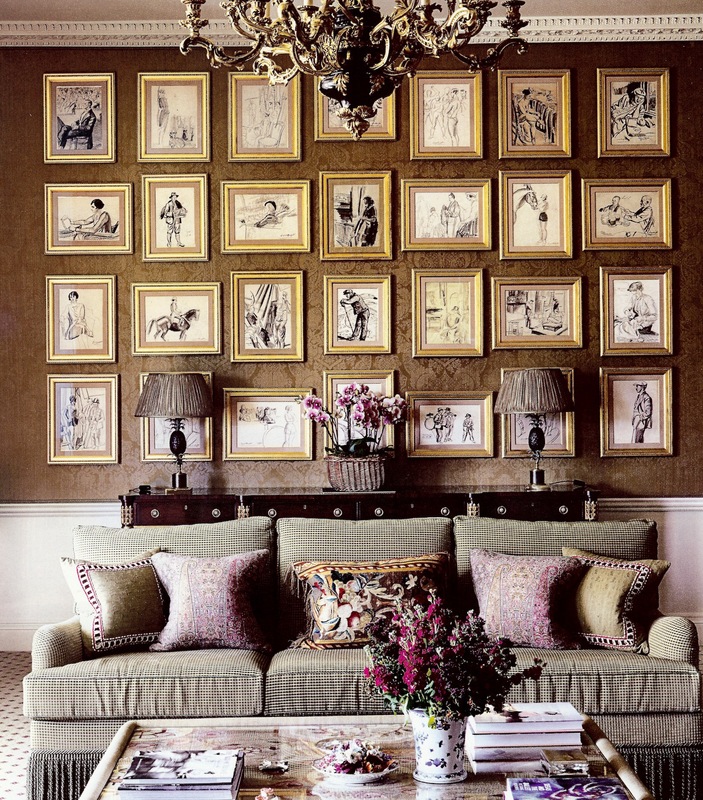 The amount of wall space covered by pictures — or the sheer number of pictures — can create a grand scale, even in a small room. How pictures are arranged on the wall or the number of walls covered by art work or photographs may combine to make a grand impression. Consider the hallway of a four-story flat in London [top] constructed above a store. A collection of colorful 1970s Communist revolutionary posters are mounted behind sheets of plexiglas and fixed flat to the wall. Their size and thematic consistency make a big impression, even in a relatively small landing space that is visually enlarged by the art. 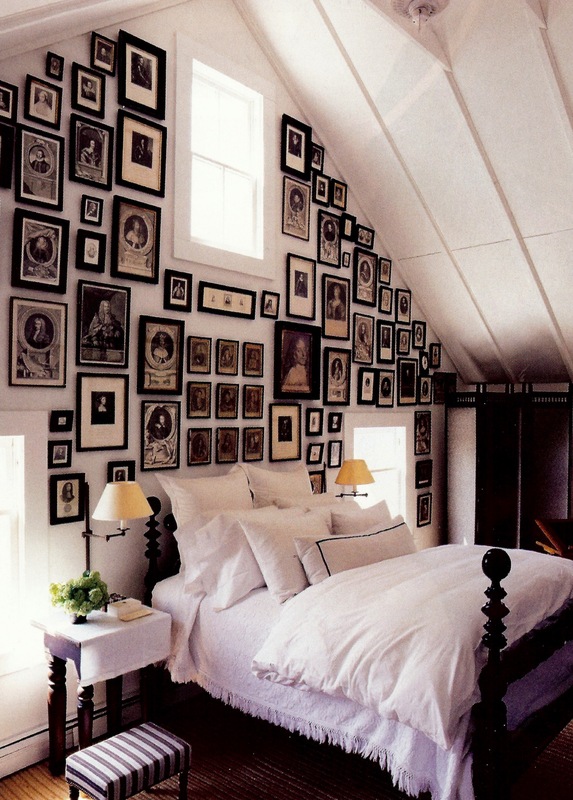 In the bedroom of a weekend home in the Hamptons, designer Nannette Brown put dozens of small portraits of British royalty in black frames and arranged the various images on a gabled bedroom wall. Massing the small pictures has a collage-like effect that dominates three windows and also accentuates the height of the ceiling. An ebonized bed frame helps keep the focus on the wall and supports the consistency of the overall look. 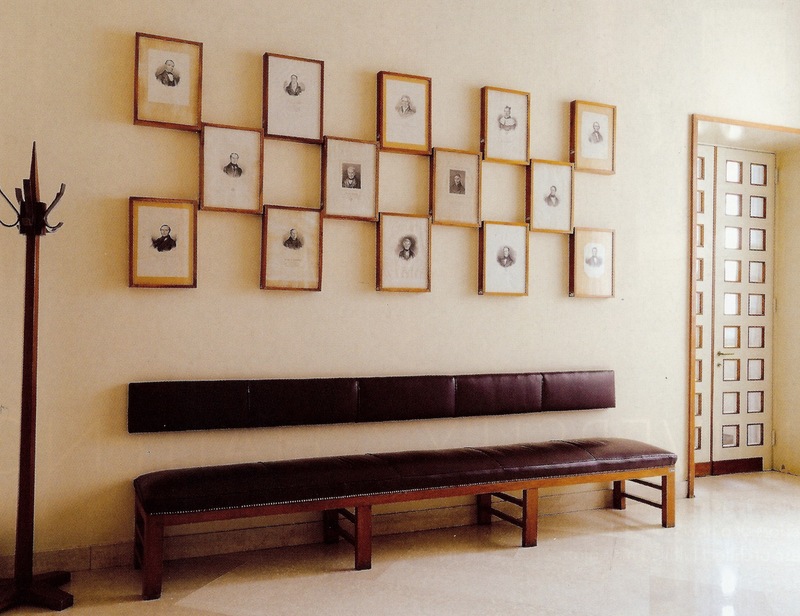 A lightly scaled composition of 14 framed engravings was masterfully composed by the Milanese architect Giò Ponti. Ponti was brought in to design a wing of the University of Padua, which included this waiting area. What’s most interesting to me is the way the pictures are hung — staggered and with the frames touching — as if they are a single piece of art. This type of arrangement is so precise it likely requires an architect’s calculations. All the same it is attractive, still modern more than half a century after its inception and could be reinterpreted brilliantly for a hallway or the right space above a king-size bed. Genius. Gilded frames unify the massive arrangement of 21 drawings from a portfolio by Dame Laura Knight. Grand both in scale, material and setting, the drawings cover the entire space between the chair rail and elaborate crown molding in a restored Georgian house in the Cotswolds. The upscale look, created by designer Mark Gillette, fits the luxe decor. The picture wall integrates the vertical and horizontal drawings and yet manages to keep the rows even by leaving just the right amount of space where it counts. Works by a single artist produce a consistent imagery that makes this type of wall successful. However, the frames could be any color and with a few deft switch outs this arrangement could be adapted to any room style. A former train station in upstate New York was converted into a country home. 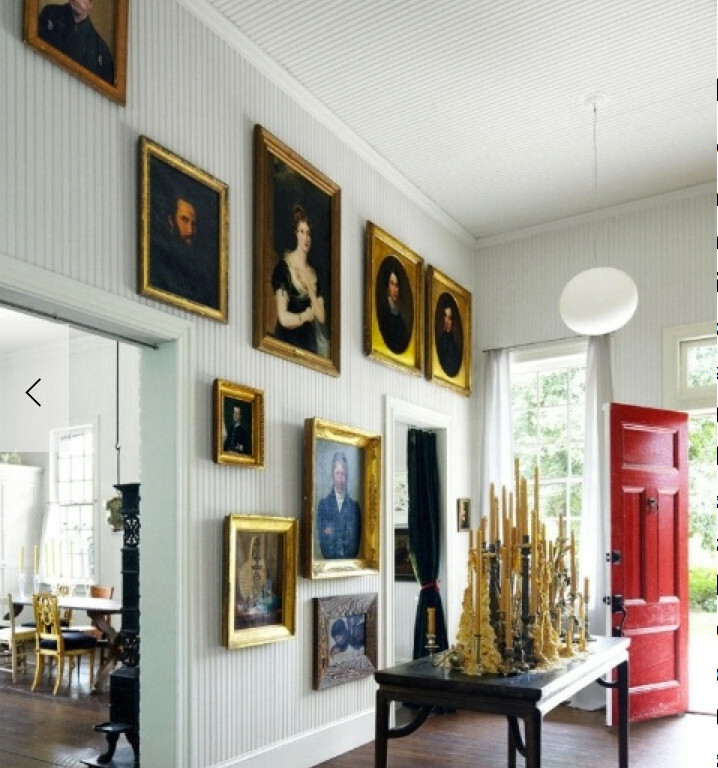 Oil portraits, purchased at auction by the owner, cover the white-painted (Benjamin Moore’s Soft Chamois) beadboard wall in an informal arrangement that is a fine match to the high ceiling and big space.